Solar Shades block the sun and keep the view. Not only do solar window shades reduce air conditioning costs, but they also protect the interior of your home from the suns harmful UV rays. Solar window screens block out 94% of the suns damaging UV rays before the sun light can even reach the glass. Solar shades are so effective because they keep glass temperatures down and have proven to be one of the most efficient ways to reduce energy costs expended on air conditioning. 50% of the solar heat entering a room comes through the glass. This accounts for approximately 20% of the load on an air conditioner! (Source: American society of Heating and Air Conditioning Engineers) In this way exterior solar shades pay for themselves year after year in increased comfort and reduced air conditioning costs, while protecting your furnishings from harmful UV rays that cause fading. Watch How Our Solar Shades Open and Close from the Exterior! 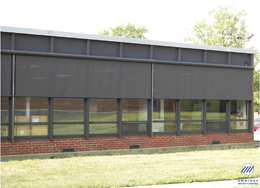 Exterior solar shades glide along stainless steel rods, cables or heavy duty aluminum extruded tracks. Contact us to learn more about all the drop shades, motorized solar shades, motorized sun shades and retractable solar screens that we offer. 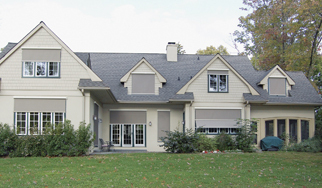 We have a solar shades and exterior window shades option for virtually any application! 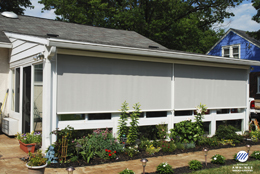 Protect your home from the sun with motorized solar shades that help you control the sun from the outside. Motorized, retractable shades block the sun's heat - paying for themselves year after year in reduced energy bills and protection of your furnishings from harmful UV rays that may cause fading. 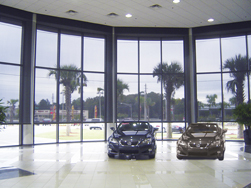 Solar shades are custom designed for your home or business with translucent or opaque fabrics in a wide variety of hues. Several models and operating systems are available for exterior solar shades, and whole house walls can be operated with a single remote control. Cassolet style shades can accommodate awning windows, and guide options include cables, rods or tracks, with or without side zippers. 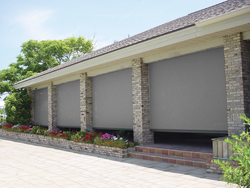 Aristocrat exterior solar shades are powered by Somfy Motors, the world's leading manufacturer of specialized motors and control systems for shade products. 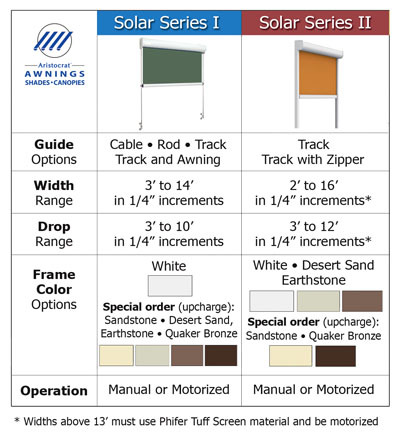 The chart to the right displays the different solar shade models, features and options available on our Solar Shade I & II product line. 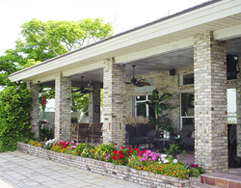 Suburban Construction will help you determine which solar shade model best fits your needs and budget. Exterior Solar Shades The MOST EFFICIENT way to block the heat of the sun is from the outside - BEFORE it has a chance to heat the window glass! Solar shades can add privacy and block the sun’s heat while still providing visibility to the outside. 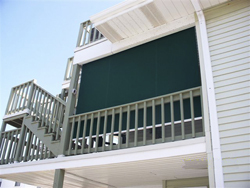 Exterior solar shades pay for themselves year after year in reduced comfort and air conditioning costs, and protect your furnishings from harmful UV rays that cause fading. Awnings have advantages that contribute to more sustainable building, according to a detailed study at the University of Minnesota’s Center for Sustainable Building Research. 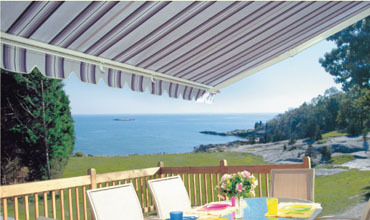 Awnings are Effective to Reduce Solar Heat Gain Solar gain (also known as solar heat gain or passive solar gain) refers to the increase in temperature that results from solar radiation. The amount of solar gain increases with the strength of the sun, and with the ability of any intervening material to transmit or resist the radiation. Objects struck by sunlight absorb the short-wave radiation from the light and re-radiate the heat at longer infrared wavelengths. Where there is a material or substance between the sun and the objects struck that is more transparent to the shorter wavelengths than the longer, then when the sun is shining the net result is an increase in temperature - solar gain. This effect, the greenhouse effect, so called due to the solar gain that is experienced behind the glass of a greenhouse, has since become well known in the context of global warming. Watch how Solar Shades Open and Close from the Interior! Please enter the number 77965 in the box provided below.